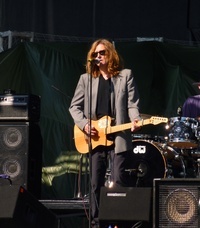 John Charles Waite (born 4 July 1952) is an English musician. He was lead vocalist for The Babys and Bad English. As a solo artist, he scored several international hits, including 1984's "Missing You", a #1 hit on the US Billboard Hot 100 and a top ten hit on the UK Singles Chart. This webpage uses material from the Wikipedia article "John_Waite" and is licensed under the GNU Free Documentation License. Reality TV World is not responsible for any errors or omissions the Wikipedia article may contain.